When I finished writing my masters thesis, I never thought it would be seen by the big wigs. The paper offered, among other things, several recommendations and suggestions based on the findings and insights from acquired data culled from various sources between 1995 to 1999 of National Steel Corporation [NSC] privatized existence. The thesis proposal was conceived and approved by the thesis committee in 2006. I had prior intimate knowledge of what was considered the golden era of NSC, first hired as an Engineering Management Trainee in 1989 when NSC was in a capacity-expansion mode; Electrical Maintenance Planner from 1995 when NSC was in privatization mode; to become the Team Leader, Technical Planning of the Plant Facilities Preservation team from 2001 for the NSC-Liquidator. Augmented with painstaking research and additional interviews, the thesis writing took about two years and finally defended on 26 September 2008. In retrospect, the thesis was first drafted in my mind several years back before I decided to resume my Master in Business Management [MBM] studies in 2005. I stopped my MBM pursuit in 1995 when I miserably failed in Economics, my fault really! It only took one failed comprehensive examinations, i.e., Economics, out of six MBM core subjects thus denying me the chance to graduate that year. For consolation, I even aced most of the five other examinations. Parts of this mental draft have to be qualified with facts and quantified with data to make a coherent whole. Once finished, a labyrinth of tangles and knots prevented me from defending the thesis. These predicaments were revealed in a series of posts beginning last October 2008. 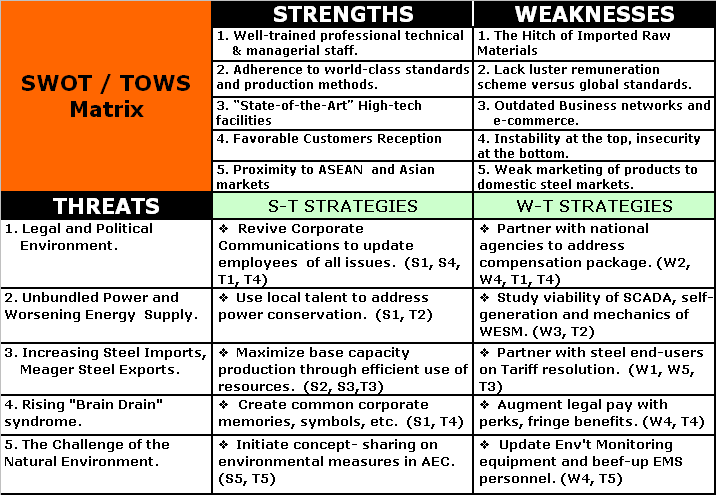 Several local managers employed at Global Steel Philippines (SPV-AMC), Inc. [GSPI] may already have had an inkling on the subject of my thesis. Some even read parts of the draft, but nobody in Global Steel Holdings, Ltd. [GSHL] management have read the final copy. One local manager even said thought-provoking and claimed that some parts he never did knew then, while another said controversial, owing to the narrative slant bordering on criticism. My former expatriate boss wanted a copy, but the University where the thesis was defended would not release the paper prior to my graduation, fearing undue attention. Later, one of the top local honchos admonished and deemed it too personal, more of a chronicle than a thesis, he claimed. That remark triggered this blog. On the other hand, he said he dreamed of writing a book on the NSC story when he retires, and added that although the events stated in the thesis were factual, but I could use some advise: delete the personal comments and innuendos, which I hoped were excised from the final copy and published as posts in this blog. A week ago this month, a staff engineer called for help regarding a risks presentation to the top management. She asked me because I was the one who lectured some of CRM staff and planners on the SWOT. I suggested that maybe she could use the SWOTs Threats and Weaknesses as Risks, and develop the presentation from there. So she did. Thus, some of the Threats in my master thesis, included in Appendix T: SWOT/TOWS Matrix were transformed into risks and these were categorized according to the FMEA concept of Severity, Occurrence and Detection. Moreover, some of the recommended strategies to turn the threats into strengths and threats into weaknesses were also adopted. That being said, it would really be good if the results of that presentation and submission of the same to the top management creates a chance that some of the recommendations would truly be addressed and resolved. For no amount of flashing presentations, full-length analyses, or expertise of hired expatriates could really address all the current risks faced by GSPI, some of which were present when it took NSC into the GSHL team, if the powers-that-be continue to overlook the obvious pretending that these issues do not really exist while boasting that money is no object! or that these risks only exist in the fertile minds of those who tend to look back at the greater things that happened during the government-owned NSC! Dreams are free, but reality is really expensive! What GSPI needs is not credit, which might be good; but hard and cold cash, which is better.